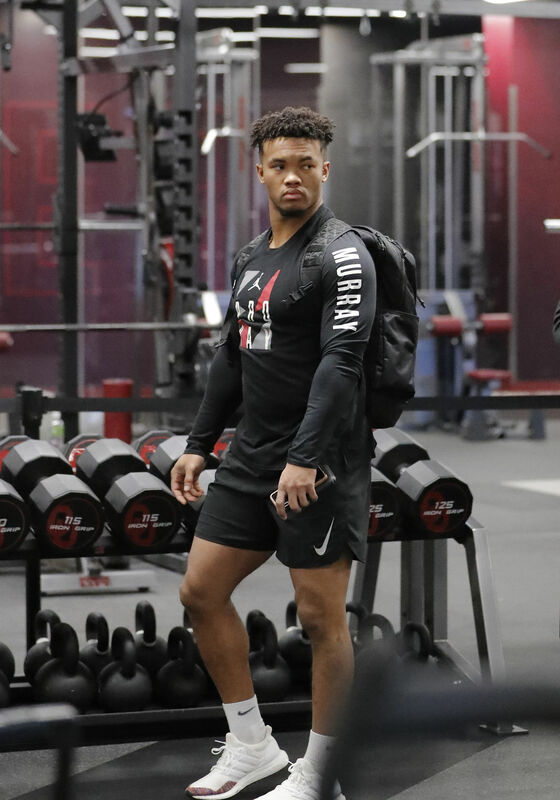 Published: March 13, 2019 at 04:15 p.m.
Quarterback Kyler Murray displays his skills for NFL coaches, general managers and scouts at the Oklahoma Pro Day a head of the 2019 NFL Draft on April 25-27th in Nashville, on Wednesday, March 2013 in Norman, Okla.
Oklahoma quarterback Kyler Murray arrives at his Pro Day. Oklahoma football quarterback Kyler Murray goes through passing drills. Oklahoma quarterback Kyler Murray prepares to go through drills. Oklahoma quarterback Kyler Murray goes through passing drills. Oklahoma quarterback Kyler Murray throws the ball during a passing drill. Oklahoma quarterback Kyler Murray (left) and wide receiver Marquise Brown watch their teammates perform at Pro Day. Oklahoma quarterback Kyler Murray (left) and Southwestern Oklahoma State quarterback Joel Blumenthal participate in positional workouts. Oklahoma quarterback Kyler Murray participates in positional workouts. Oklahoma football staff member Merv Johnson, left, talks to Oklahoma quarterback Kyler Murray.